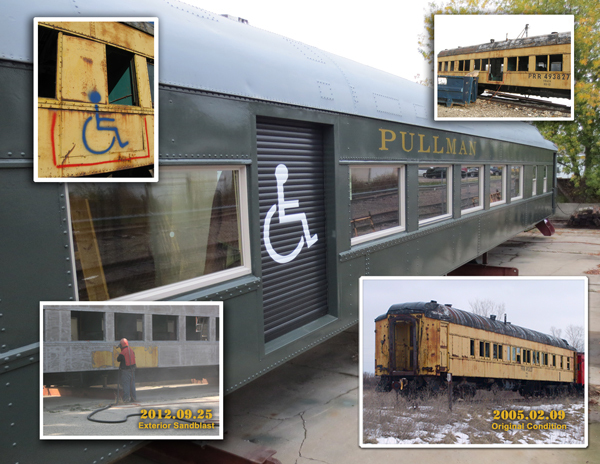 One of the primary projects this organization was tasked with upon its founding was that of providing a means for disabled individuals in West Michigan to enjoy historic railroading. 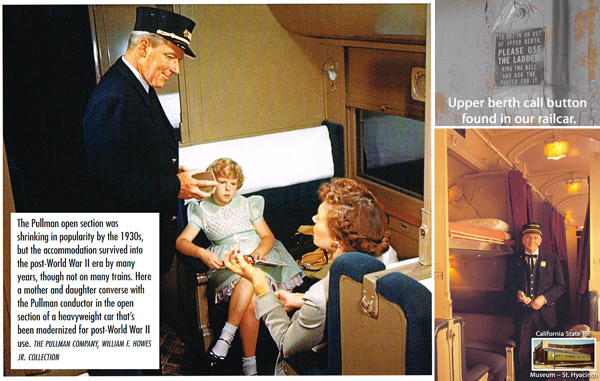 The AllAboard Campaign began in 2005 to raise funds to renovate a historic 1929 Pullman Sleeper to ADA standards. Fallen Angel – from glorious “Pan-American” passenger service, the La Reine had been resigned to vandalized, ignoble storage. The board completed a nation-wide search for a suitable and affordable railcar candidate and found one in our own backyard. 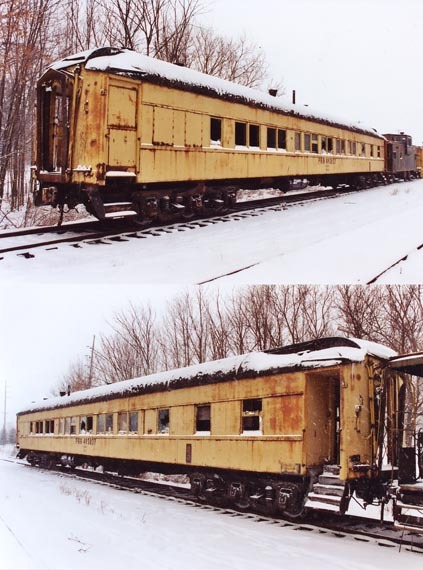 Among the inventory of rail cars in storage at The Coopersville & Marne Railway yard was one saved from the scrapyard by one of the C&M founders. The “La Reine” railcar is an all-steel, 10-1-1 heavyweight sleeper constructed in 1929 by the Pullman-Standard Company in according to plan 3973A with 24-11 wheel sets. It consisted of 10 sections, one drawing room and one compartment. The L&N’s Pan American offered connections from America’s midwest to the warmer climes of Central America via steamship from the Gulf Coast. 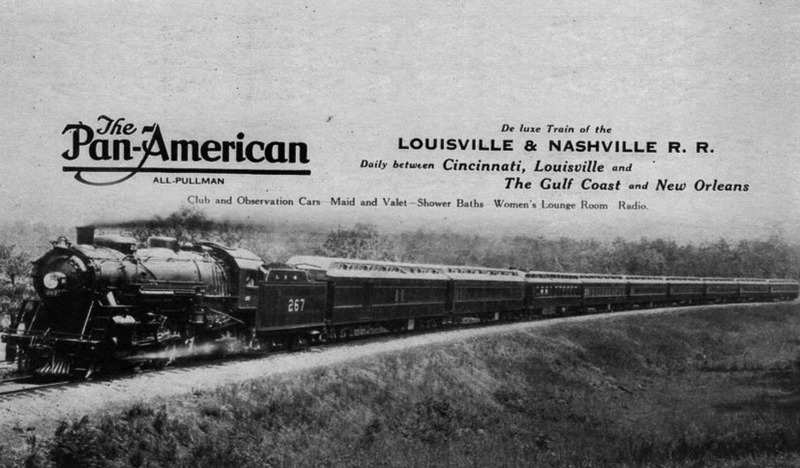 Originally leased to the Louisville & Nashville Railway to be operated on its famous, “Pan-American” line it was one of six cars named after Canadian rivers. To stay competitive and meet customer comfort expectations, the car was retrofitted with electro-mechanical air conditioning at Pullman’s Calumet shops in 1935. Subsequent to WW II and the 1948 Pullman anti-trust lawsuit the car was sold to the Pennsylvania Railroad (PRR) and leased back to Pullman. With the continual decline of rail travel and the introduction of lightweight aluminum-clad cars the La Reine was mothballed. Eventually it ended up being converted to a work car for the PRR at which time the lavatories on each end were removed along with the compartment and drawing rooms leaving the drawing room restroom and six sections for crew sleeping quarters. The La Reine went through several owners before ending up at the C&M upon this organizations’ founding. 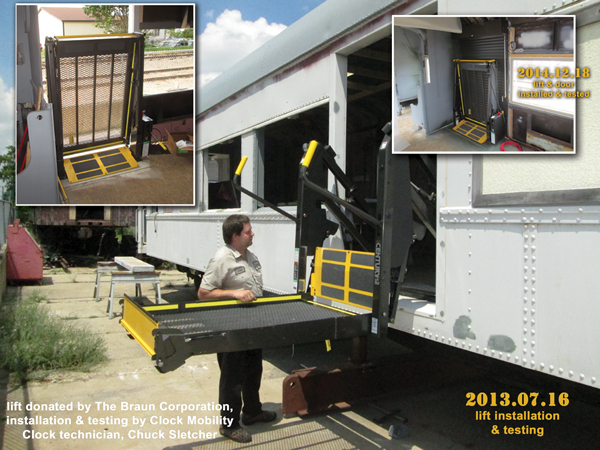 This ADA Railcar Project was featured in the Pennsylvania Technical Association’s magazine, The Keystone, titled, LaReine to Live Again and co-authored by former member, James Winslow. Original estimated funding requirements were met in 2008 with donations and grants from local Community Foundations – Ed & Nancy Hanenburg Community Fund, The Meijer Foundation, The Steelcase Foundation, Steve & Kathryn Bandstra Foundation, The Hekman Foundation, The Howard Best Fund, The Fuller Foundation – Byker Fund, Ryan J. Byle Memorial Fund and many individual donor funds. Final paint, windows and lettering have been installed by the end of 2014. We now have a solid enclosed shell with working ADA lift and access door. At the December 18, 2014 board meeting, contractor estimates to complete the project were reviewed with an additional $130,000 required to complete the interior renovations, rehab the brakes and running gear and re-track the railcar. A $25,000 challenge grant has been pledged against the the additional funds required to finalize this project. Any size matching grant/donations are welcomed and appreciated.